It is imperative that students have an understanding of the logic of positive and negative exponents before they can start multiplying and dividing with them. This is a foundational lesson that dives into not only how to convert negative exponents to positive exponents but also teaches the logic behind this conversion. 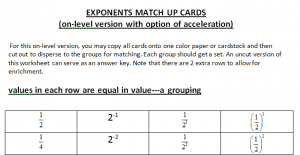 Students will be able to convert integer exponents into standard form. Students will have an understanding of and be able to work with negative and positive exponents. Have students work with their table groups for this activity. Discuss how they decided to build the shapes. Also, discuss where these numbers appear on a multiplication table. Have students color in all numbers on the multiplication table that could result in perfect squares. Point out that each perfect square is made by multiplying a number by itself, or taking a number to the second power. Fill in the squared column for the table on the Integer Exponents Intro Worksheet. Discuss with the students why these numbers do not appear in a straight forward pattern on a multiplication table. Guide them to the understanding that a multiplication table only has two values being multiplied together. I have included a challenge investigation in which students can use a multiplication table to find cubes. Point out that each perfect cube is made by multiplying a number by itself and then by itself again, or taking a number to the third power. Fill in the cubed column for the table on the Integer Exponents Intro Worksheet. Let’s look at the two’s row. When we have 21, what is our base? What is our exponent? What does this integer exponent mean? What is 21? Would this hold true for all other integers to the first power? Have students fill in the “n1” column. Can anybody see a pattern happening in the two’s row? What is the rule for the row? Students should point out that each column is double (or times 2) the column to the left of it. Write this rule on the worksheet for the two’s row. When we have 20, what is our base? What is our exponent? Let’s look at our rule for this row. What number, when we double it or multiply it by two, gives us 2? Would this hold true for all other integers to the zero power? Have students fill in the “n0” column. Let’s go back to the two’s row. When we have 2-1, what is our base? What is our exponent? Let’s look at our rule for this row. What number, when we double it or multiply it by two, gives us 1? How are 2-1 and 21 related? Help them understand that they are reciprocals. When we have 2-2, what is our base? What is our exponent? Let’s look at our rule for this row. What number, when we double it or multiply it by two, gives us ½? How are 2-2 and 22 related? When we have 2-3, what is our base? What is our exponent? Let’s look at our rule for this row. What number, when we double it or multiply it by two, gives us ¼? How are 2-3 and 23 related? Guide the students through the same reasoning with the one’s row, the three’s row and the negative two’s row. Have the students work with their group to complete the remaining rows. Check in with the class upon completion. Go over the answers as a group to check for accuracy at the end. An alternative option, if you do not need to use the cards again for another class, you can have the students staple together the pieces or organize them on a poster paper to use this activity as a group assessment. Homework/Review practice can be worksheets including work with negative and positive exponents. Know and apply the properties of integer exponents to generate equivalent numerical expressions. For example, 32 × 3-5 = 3-3 = 1/33 = 1/27.